General view of Knightstone in Weston-super-Mare, the Victorian seaport situated on the Bristol Channel in south-western England. Knightstone provides lodgings for visiting invalids as well as a refreshment room and reading room. 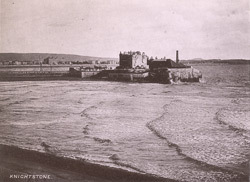 Spa baths opened at Knightstone in July 1820. Originally an island, a low causeway was later built to connect Knightstone to the mainland.